Jessica has lived under Lucas' employ for three years. But their arrangement is far from traditional... Jessica is his food. Charged with supplying her master with life sustaining blood he needs as a vampire, Jessica has secretly fallen for Lucas. But she doesn't dare breathe a word of it to him, or to the others in his employ--especially Gretchen, who does little to hide her dislike for Jessica, or her jealousy when it comes to sharing Lucas. As the story unfolds, Jessica discovers Lucas may be developing feelings for her, which stirs up issues from her past, and creates an inner battle as she attempts to hide her emotions. Jessica has no where else to go. Thus, maintaining her position is all the more vital. She struggles to steer clear of any conduct that would jeopardize her stability. Still, she can't help fantasizing about what life would be like with Lucas. Even Gretchen has her suspicions that something is brewing, leading to a series of actions that will ultimately shift the course for all those involved. And there is a lot at stake for Jessica. Not only is she losing her footing, but the love she desires is becoming all the more elusive... and a secret is about to be exposed. Some events felt a bit rushed, and there were a few minor inconsistencies, but it didn't take away from my enjoyment of the story. Lucas is gorgeous, loyal, and fiercely protective of those around him. He doesn't pity Jessica for her troubled past, nor does he take advantage of the fact that she is at his mercy. Instead, he shows compassion for her hardships. Still, he is a vampire, living in a household with other supernatural creatures, so a few surprises are to be expected! 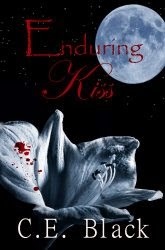 I'm so glad you enjoyed reading Enduring Kiss and thank you for the review! Event - Liebster Award Nomination!